View - 56 N Chester Av. 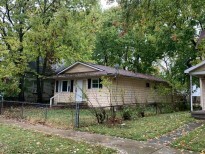 GREAT STARTER HOME FOR SINGLE FAMILY OR INVESTORS. FENCED IN YARD.. LOCATION IS CLOSE TO SHOPPING AND MAJOR HIGHWAYS. CONVENIENTLY CLOSE TO DOWNTOWN. MUST SEE IN PERSON.